Paul shares the following story, first about the beauty of his Mom’s passing, then some details about her amazing life. 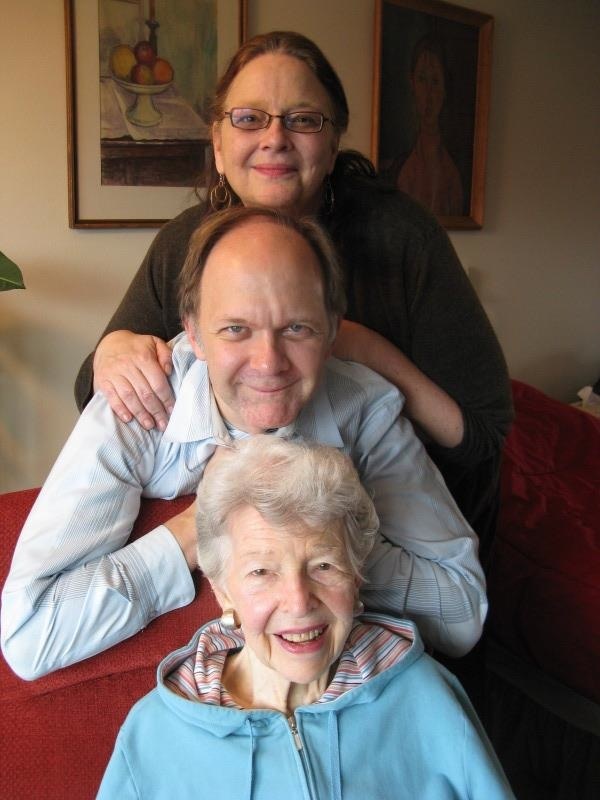 Photo of Judith Mowry, Paul’s sister, Paul, and their Mom, Marge. Yesterday we decided to move her from the hospital to the skilled nursing floor of her retirement complex. She had always wanted to die at home. A mighty stream of visitors immediately began flowing to and from her room as dear friends and staff and caregivers of her building came to say their goodbyes. Her pulse was strong and her extremities warm, so we were prepared to sit vigil for the next several days. At 11:00 P.M., four caregivers from her assisted living floor appeared. They were especially close to my mom and they asked, “Who is ringing her call button?! It’s ringing and she always called us around this time of night.” The call button was in my sister’s purse and somehow had been activated, though we couldn’t figure out how. (Insert Twilight Zone music here.) They said their goodbyes with love and tears and left. I turned off the lights and laid on the lumpy cot around 12:30 A.M. “I love you, Mom,” I called over to her. At 2:15 A.M. one of the nurses woke me. “She hasn’t taken a breath for several minutes.” I got up and reached over. She was gone. It was a most remarkably peaceful passing. A founding member of the Robert Shaw Chorale, and a soloist with a smaller Shaw group that performed on radio and television, she had many happy memories of performing on stage, at Town Hall and Carnegie Hall, on NBC with Arturo Toscanini conducting, and one of her most beloved credits — as Mother Giraffe on a Mister Rogers record called “Josephine the Short-Necked Giraffe.” She was also a VISTA volunteer, adult literacy teacher, Director of the Missouri NARAL affiliate, Assistant Dean of Students at her alma mater, Monmouth College, AIDS Buddy, and served PFLAG as a warrior mom, local president, and member of the national board. And that’s not even the half of it. So much of me has been shaped by her. I was always deeply proud of her courage, compassion, fight for justice, intelligence, singing, and real interest and caring and love for people. And she gave me three of the most amazing people I know: my sisters Jane and Judith, and my brother, Sam. I will miss her tremendously. I am so grateful for her rich life, our great friendship, and her peaceful goodbye. And I thank all of you who have reached out to me or my family with caring words and tender hearts during these very intense, yet brief, days. Click here to hear a lovely version of ‘O Holy Night’ with photos, posted by Paul’s brother Sam.